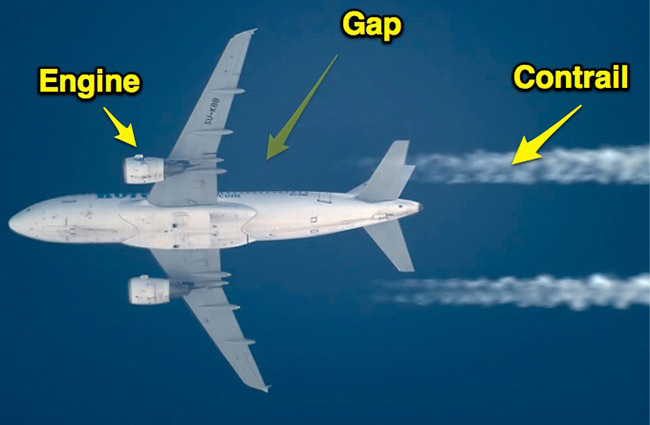 Contrails - short for "condensation trails" or vapor trails - are line-shaped clouds sometimes produced by aircraft engine exhaust, typically at aircraft cruise altitudes several miles above the Earth's surface. Contrails are composed primarily of water, in the form of ice crystals. The combination of water vapor in aircraft engine exhaust and the low ambient temperatures that often exists at these high altitudes allows the formation of the trails. Impurities in the jet exhaust from the fuel, including sulfur compounds (0.05% by weight in jet fuel) provide some of the particles that can serve as sites for water droplet growth in the exhaust and, if water droplets form, they might freeze to form ice particles that compose a contrail Their formation can also be triggered by changes in air pressure in wingtip vortices or in the air over the entire wing surface. 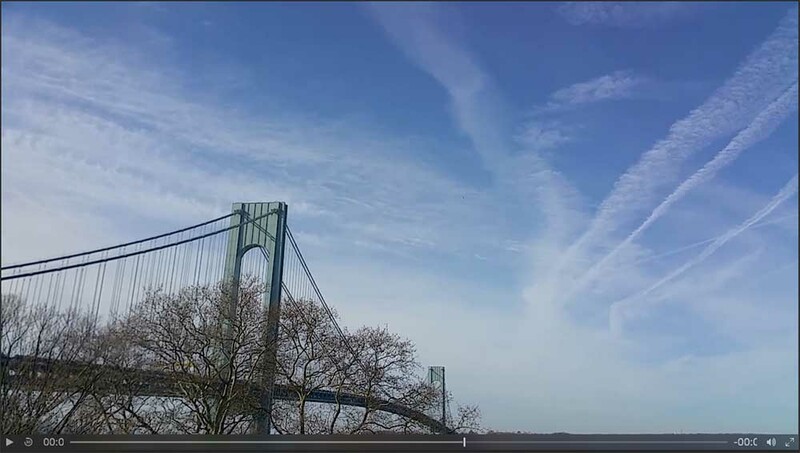 According to the chemtrail conspiracy theory, long-lasting trails left in the sky by high-flying aircraft are chemical or biological agents deliberately sprayed for sinister purposes undisclosed to the general public. 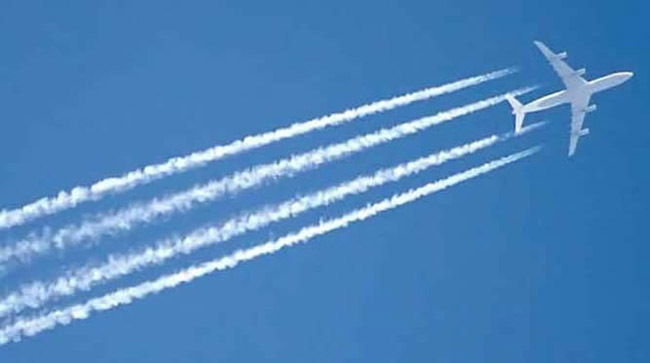 Believers in the theory argue that normal contrails dissipate relatively quickly, and contrails that do not dissipate must contain additional substances. 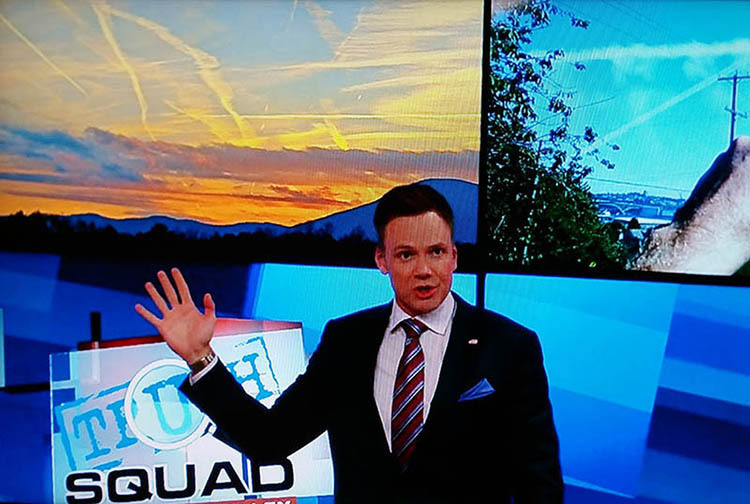 These arguments have been dismissed by the scientific community: such trails are normal water-based contrails (condensation trails) that are routinely left by high-flying aircraft under certain atmospheric conditions. Although proponents have attempted to prove that the claimed chemical spraying does take place, their analyses have been flawed or based on misconceptions. Because of the widespread popularity of the conspiracy theory, official agencies have received many inquiries from people demanding an explanation. Scientists and government officials around the world have repeatedly needed to confirm that supposed chemtrails are in fact normal contrails.